Dr. Teresa Caraway, CEO of Hearing First talked with Dr. Jace Wolfe, Director of Audiology and Research at Hearts for Hearing to share essential advice for parents who are helping their child with hearing loss learn to listen and talk. Every decibel counts. Research shows that for best outcomes, hearing aid volume should be within five decibels of the prescriptive targets. 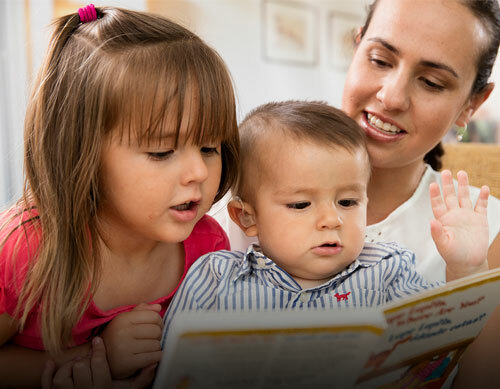 Dr. Wolfe and Dr. Caraway discuss why the precise volume matters and how to ensure your child’s hearing aids are operating within the prescribed range so their brain can have access to all the sounds of speech. 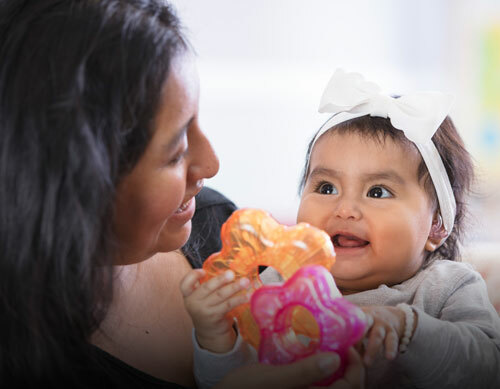 Babies are learners from Day One and hearing is important for stimulating the brain, growing neural networks, and laying the foundation for literacy. Research shows that the earlier a child receives access to sound, the better their listening and spoken language outcomes. 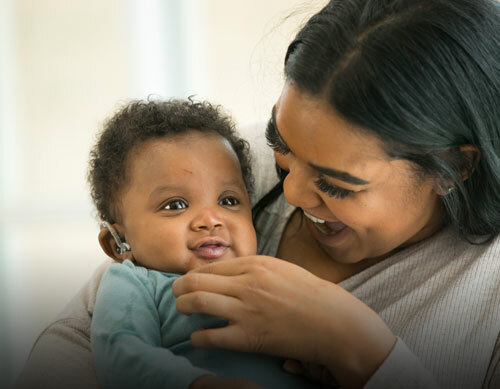 Newborn hearing screening ensures babies are identified early with hearing loss and fit with hearing aids within the first few weeks of life. Recent research shows that babies identified with severe to profound hearing loss, who receive a cochlear implant as early as 6 or 9 months of age, are at a significant advantage for developing age-appropriate speech, language and vocabulary skills when compared to children who are implanted at a later age. This catchy motto is an important reminder for families and professionals who are supporting children on their listening and spoken language (LSL) journey. A child’s hearing aids should be turned on and functioning during all waking hours (approximately 10 hours per day), to achieve the best outcomes and develop age-appropriate speech and language. Eyes Open... Hearing Technology On! There are several factors to consider when selecting hearing technology for a child. For many children, hearing aids can provide full auditory access to the brain, but some children with more significant hearing loss can benefit from a cochlear implant. Dr. Wolfe and Dr. Caraway discuss the process for evaluating each child’s situation as a collaborative team – including parents, Listening and Spoken Language specialists, pediatric audiologists, and medical physicians – to ensure the best possible auditory access for speech and language development. We know that a child’s hearing aids should be on and be functioning during all waking hours but keeping hearing aids on babies takes persistence! Dr. Wolfe and Dr. Caraway discuss tips and techniques to help keep the hearing technology on a child as well as recognizing signs that the hearing aids may need to be adjusted. 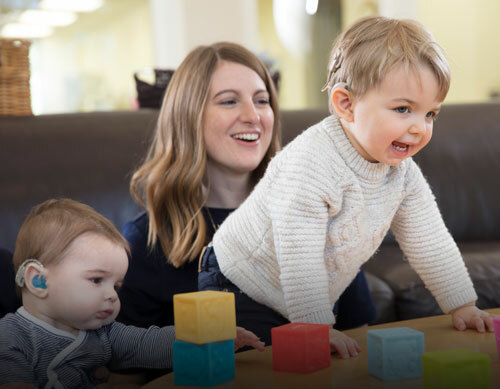 To continue learning about supporting children with hearing loss, Hearing First invites you to check out the ‘Start with the Brain and Connect the Dots’ ebook or visit HearingFirst.org. Dr. Teresa Caraway is the CEO of Hearing First that supports the families and professionals on the Listening and Spoken Language (LSL) journey through Awareness, Education, and Community, so that children who are deaf or hard of hearing can learn to listen and talk. Dr. Jace Wolfe, Director of Audiology and Research at Hearts for Hearing, joined Dr. Teresa Caraway, CEO of Hearing First, to share essential advice for parents who are helping their child with hearing loss learn to listen and talk.